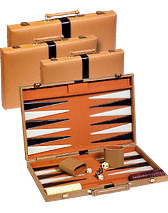 Leather Backgammon Sets, Velour Backgammon Sets, Wood Backgammon Sets, and Doubling Cubes! 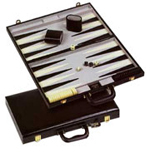 You can choose from a wide selection of high quality backgammon sets. We carry Genuine Leather Backgammon Sets, Velour Backgammon Sets, Leatherette Backgammon Sets, and "Hand-Crafted" Wood Backgammon Sets. All our sets come complete with everything for play, as detailed in the descriptions below. We also offer Marbleized Backgammon Doubling Cubes in five different colors: green, red, blue, white, and black. All our backgammon supplies are in stock for immediate shipment. For more information, click on the links below or contact us toll free at 1-800-233-0828.